For most homeowners, discovering a rodent in your home is incredibly unsettling and can be a major pest control issue. Mice and rats can squeeze through the tiniest of holes and crevices to enter into your home, using pipes, gaps beneath doors, and utility lines. ¼ of an inch is all it takes. For most homeowners, discovering a rodent in your home is incredibly unsettling and can be a major pest control issue. Mice and rats can squeeze through the tiniest of holes and crevices to enter into your home, using pipes, gaps beneath doors, and utility lines. ¼ of an inch is all it takes. To put it into perspective, if a #2 pencil can fit through a hole, so can a rodent! So I have rodents! What does that come with? Droppings: The average rodent “deposits” 50 droppings per day! Grease marks: Rodents routinely rub their bodies against runways and walls. Disease: Rodents are known to transmit Hantavirus, Salmonella, and other diseases. 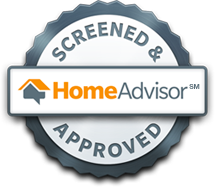 Their continued presence can also diminish air quality in your home. Other Pests: Rats can easily spread fleas, ticks, mites, and other pests! But fear not, Arrow has the solution! Exterior Exclusion: Arrow will identify the areas of rodent entry and will seal those areas and other common entry points so future rodent infestations don’t occur. Interior Glue Boards: Arrow will utilize scented non-toxic glue boards inside the structure. This makes for a quick catch and easy disposal for the homeowner. Interior Snap Traps: Arrow will strategically place lured snap traps and come back to check the traps and dispose of any rodents. Sanitation: Arrow does offer clean-up services in attics for rodent infestations that cause severe odor and threats to air quality due to heavy urine and feces. This is done through sanitizers, misting machines, vacuums, and physical removal of nests and other infested materials. Exterior Rodent Stations: These secured boxes are placed outside with bait or snap traps inside and are monitored on a routine basis. *If bait is used, Arrow does not guarantee that a rodent will not die in your wall. Education: Arrow will educate you on how to make your home naturally less appealing the rodents! Please view our Rodent Tips Below! Rodent Tips: In general, cleanliness is the enemy of rodents! Make sure any pet food is secure and stored properly. Do not leave pet food (or any food) out overnight. Trash needs to be secured properly where rodents do not have easy access. Vegetation needs to be cut back from the home as much as possible. Trees do not need to be overhanging the home. Make sure your home has proper drainage and no standing water is around that will attract rodents. Small bird baths and clogged gutters are common to attract rodents. Routinely inspect your home for cracks and potential entry points for rodents. A/C vents and other utilities going into your wall are common points. Rodents can scale walls vertically. Remember to inspect attics vents and eaves for entry points as well. 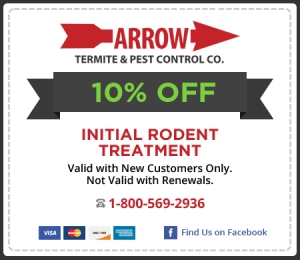 Current Customers: Preventative exclusion and rodent control can be added to a regular pest control contract for a nominal fee. Please call for more details.